In small bowl, sprinkle gelatin over 1 tablespoon whipping cream; set aside to soften gelatin. In food processor, place strawberries and powdered sugar. Cover; process until smooth. Pour mixture into 1-quart saucepan; add softened gelatin. Cook over medium heat, beating with whisk occasionally, until mixture comes to a simmer and gelatin is dissolved. Remove from heat; cool 30 minutes. In small bowl, beat whipping cream with electric mixer on high speed until stiff peaks form. On low speed, beat strawberry mixture into whipped cream until blended. Place mousse in decorating bag fitted with small star tip. Pipe mousse into chocolate cups. Refrigerate until set, about 30 minutes, or up to 2 hours before serving. Garnish with fresh sliced strawberries, if desired. 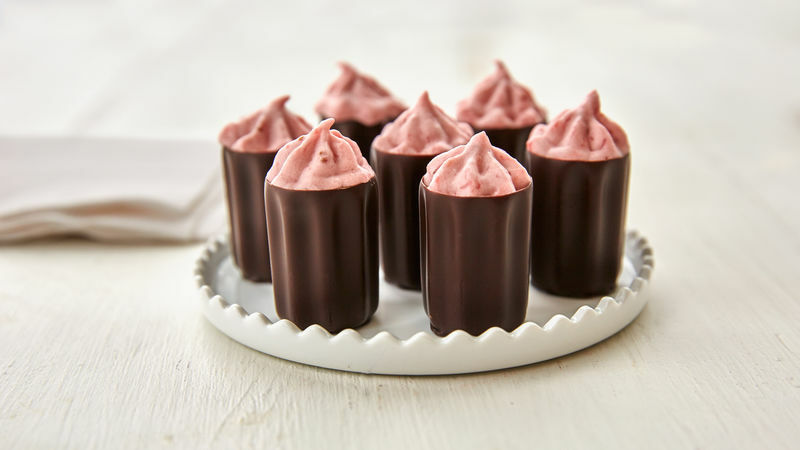 If premade chocolate cups are unavailable, you can make your own by painting the inside of mini paper cups with tempered chocolate or confectionary chocolate (this kind does not require tempering but is sweeter).